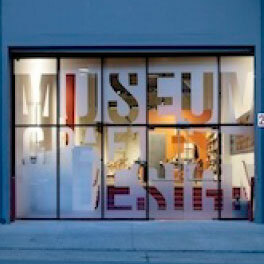 The new permanent home of the Museum of Craft and Design is located at 2569 Third Street (between 22nd and 23rd) in the historic American Industrial Center building, originally home to American Can Company (1915), in the heart of San Francisco’s Dogpatch district. Designed by Gary Hutton Design and architect-of-record McCall Design Group, the 8,500 square foot museum incorporates 4,000 square feet of flexible exhibition and public programming space, while housing the Museum’s office spaces and a converted loading dock streetfront Museum Store. A primary characteristic is the use of glass and concrete, which creates a transparent visual poetry in the delineation of the entrance and interior spaces and maintains the industrial integrity of the building. Coupled with exposed industrial ducting, 24 foot concrete columns and ceilings, brick, movable walls and thoroughly considered sight lines, the museum will be an exciting new arts destination in San Francisco and beacon for the historic Dogpatch district. Follow us on Facebook and Twitter and now Vimeo, thanks to our friends at Creativebug. Thank you for your interest and support. We look forward to seeing you soon! Windgate Charitable Foundation and Grants for the Arts/San Francisco Hotel Tax Fund.